Today Apple released a new generation of iMacs that sport an exciting new design, with glass and aluminum as the primary case materials. 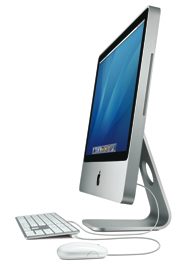 The new iMac models are much slimmer, have a glossy glass screen and an aluminum casing similar to previous rumors. The iMac also comes with the new slim keyboard that was leaked on gadget websites a few weeks ago, with new button functions and low-profile keys. The new iMacs are available at $1,199 for the 20-inch, $1,499 for the 20-inch with a processor and graphics upgrade, and $1,799 for the 24-inch iMac.